Deirdre Wood is a hand weaver and dyer, working in Winchester in Hampshire. Since the 1990s Deirdre has developed the ancient technique of narrow strip-weaving to create abstract architectural textiles for exhibition and commission. Often many yards of narrow woven cloth are twisted and turned before being joined by sewing to make three dimensional wall-hangings. Sometimes the long narrow fabric is cut into sections before sewing, or the complete warp may be used to make triangles, rectangles diamonds and squares. More recently Deirdre has devised a novel technique that produces long, curved woven strips. This entirely new approach to weaving exploits the contrasting properties of linen and silk to create rings and discs. Although the cloth is woven straight, it becomes dramatically curved when cut from the loom and treated with finishing processes. Deirdre Wood trained originally as potter and in her early career helped her husband Nigel Wood with the running of Meon Pottery, in Hampshire. However, textiles and in particular strip-weaving remained a long-standing fascination. When the opportunity arose, Deirdre studied for a degree in woven textiles at the West Surrey College of Art Design (1992–5). While a student at Farnham Deirdre won the Clothworker’s Foundation Travel Award from the Royal Society of Arts. In 1996, with the help of this award, she travelled to Mali, West Africa to study the traditional strip woven fabrics of the region – particularly the beautiful and exciting Bogolanfini and indigo clothes produced by the Bamana and Dogon tribespeople. This field trip to West Africa has remained a continuing source of inspiration. More recently, in 2013, Deirdre was one of three textile artists selected to represent the UK at the 14th International Triennial of Tapestry held in Lodz, Poland. 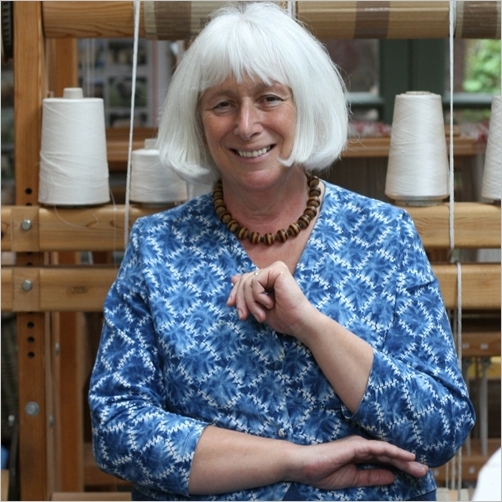 Also in 2013 Deirdre was the winner of the Peter Collingwood Trust Award for innovation in weaving, particularly for her circular narrow-strip textiles. 2012–13 Royal Society of Arts, London. Display of Circular Woven Rings. 2006 Beyond the Straight and Narrow. Hove Museum and Art Gallery, Sussex. 2005 Straight and Narrow. The Crafts Study Centre, Farnham, Surrey. 2004 Straight and Narrow. The Hub, Sleaford, Lincolnshire. 2003 Tapestry – but not as we know it. Gosport Museum & Gallery, Hampshire. 2002–3 Riches from Rags. Havant Museum, Hampshire. 2013 14th International Triennial of Tapestry, Central Museum of Textiles, Lodz, Poland. 2009 Focus Exhibition. Contemporary Applied Arts, London. 2009 Joined Together. (with Jonathan Garratt and Nick Barberton) Salisbury Arts Centre. 2001 Acknowledged Sources (with Magdalena Odundo and Steve Wright). Russell Cotes Art Gallery and Museum, Bournemouth. 2000 Twist and Turn. Atrium Gallery, Bournemouth University. 1999 Southern Craftmakers – an exhibition curated by Margot Coatts. Beatrice Royal Contemporary Art & Craft, Quay Arts, Newport, Isle of Wight. 2006 Harper, Dr Catherine. Crafts Magazine. pp 58–9, Vol 198, January/February. 2003 Ediss, Tina. The Lady Magazine. pp 46–7, Vol.224, No.6149.